Danielle Hill and Jordan Sloan are pleased after achieving the nomination time for the Commonwealth Games at the Ulster Long Course Swimming Championships in Bangor. 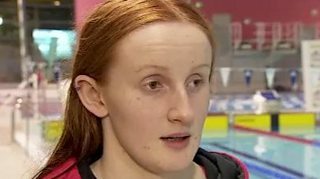 Larne teenager Hill lowered her Irish record by winning the 50m backstroke in 28.72 seconds - the Games consideration mark is 28.81. Sloan, a 24-year-old from Bangor, gained the nomination time in the 200m freestyle.